Eduardo Pondal (b. 1835, d. 1917) is the second eminent poet of Spanish Galicia (also known as Galiza).1 He too was highly educated. He obtained the equivalent of a high-school diploma with pre-university training in medicine and surgery from the University of Santiago de Compostela (April 6, 1859) plus the equivalent of a Doctor of Medicine degree from the same university a year later (June 18, 1860) and the equivalent military rank of health care officer after passing tough entrance examinations at the military academy of health care in Madrid (1861 or 1863, sources vary). He served at the naval base of Ferrol and in the huge weapons factory at Trubia in the Spanish region of Asturias (also known as Asturies). After a month of service in Trubia he was granted leave of absence to attend to an urgent family matter, he never returned. Your grand future is locked up within yourselves. The social repercussion of the toasts and banquet was enormous. Pondal and Aguirre narrowly escaped exile to the Northern Mariana Islands and they made a partial retraction.3,4 The retractions coincided with the consolidation of the Conservative coup d'état staged by general Leopoldo O'Donnell in July. The Conservatives returned general Narváez to the presidency in October of the following year (1857). This general had been responsible for the bloody suppression of the Liberal uprising of 1846.
diante do oprobio duro e ferroento. da patria o oprobio duro e ferroento. Confronted with the hard, ironhanded affront. Exempt from so much infamy. The hard and ironhanded humiliation of the homeland. Pondal went from Trubia to Ponteceso in 1864. 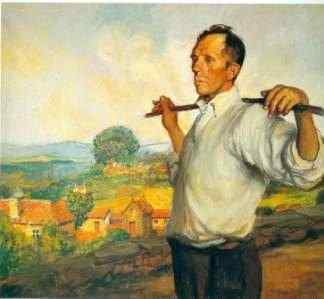 He was a happy man in the countryside that enchanted him so (poem 8). Naturally the friends he had made and the locales he had visited during his student years pulled him away to Santiago de Compostela on occasion. He also became a regular patron of the "Cova Céltica" (Celtic Cave) symposia held in a bookstore of the city of A Coruña where old friends like Manuel Murguía and new ones met for animated discussions on the future of Galicia and of Galician literature. Murguía acquainted him with the writings of the Scottish bard James Macpherson (b. 1736, d. 1796) and the Ossian cycle of poems became the second major influence on Pondal's literary imagination, the first being the voluminous work of poetry entitled "Os Lusíadas" written by the Portuguese bard Luiz Vaz de Camões (b. 1524, d. 1580). Pondal had these two mentors in mind when he wrote the two verses, "The time of the ages of bards has arrived" (poem 9, 4.1-2). O paso abrío ao luminoso Oriente. Opened the route to the bright East. Pondal's lifelong ambition was to pen an epic similar to "Os Lusíadas." His carried the title "Os Eoas" (The Sons of the Sun) but his punctiliousness barred him from finishing the oeuvre to his satisfaction and he died before publishing it, disappointing many of his contemporary readers at home and abroad, yet the failure underscores his commitment to make the Galician language a vehicle for literary masterpieces comparable to Camões' and thus to gain for it redemption from the "scurrilous soubriquet" (poem 9, 5.7). Any public attempt to honour the native language offended the "odious, groveling vermin that commonly crawl on the trails...the deserters of the sweet, dear homeland" (below). These "vermin" refused to speak Galician, ridiculed those who did and demanded that others speak Spanish in their presence. The bard of Bergantiños wrote this acerbic poem to rebuff them, almost certainly returning the verbal abuse that he and other members of the "Cova Céltica" had put up with now and then. To the sad, hard ground. For the rude accent of the Toledan? In those dour, strident accents? Your soft, silken speech for theirs? So your own tongue won't be tainted. 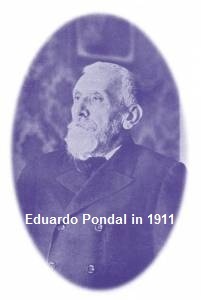 Pondal lived through the Spanish-American War of 1898.9 His habitual exaltation of the warrior figure (Villafañe in poem 8, Leonidas in poem 10) led him to write a panegyric to a Spanish general named Valeriano Weyler. This general was so popular that Melchor Bordoy composed an anthem in his honour in 1897, the same year that Pondal wrote this tribute. Weyler removed many Cuban peasants from their villages and interned them in overcrowded facilities guarded by troops, a policy he dubbed "reconcentration." As a result of his policy hundreds of thousands of Cubans died of starvation or disease. General Weyler was the father of the modern internment or concentration camp. Todos á doce patria retornaron. E o vasto incendio intrépido afrontastes. Every one returned to the sweet homeland. le lourd alligator nous défie. tresaille dans se bois de palmiers. Français, qu'est ce que nous entendons ? Français, qu'est ce que vous entendez ? My good friends, liven up! My opinion is that you must wash your legs and feet with an infusion of leaves and small stems from the following plants growing in that orchard: rosemary, lemon balm, lemon verbena. Place a small piece of cloth soaked in that water over the swollen area and wear a compression stocking. You can also drink [125 ml] of Mondariz water or of beer, I will be happy to send you the one out of the two which you prefer. This and taking a walk outdoors around the orchard every once in a while will do you good, a lot of good. Drink a good glass of milk with every chocolate and exercise moderately. Ao ver meu cor mortal, din:—Está morto. Canta tribulación esquiva e dura. Say upon seeing my mortal colour, "He is dead." How much difficult and tough tribulation." 1 There exists in Europe another Galicia whose origin is the whimsical title, "Kingdom of Galicia and Lodomeria," given by the Austro-Hungarian Empire to crownland on its northern frontier in the year 1772. The territory was inhabited mainly by Poles (who call it "Galicja") and by Ukrainians (who call it "Halychyna"). The empire made the town of Lwów (Ukrainian Lviv) capital of Galicia. In Lwów died the Polish Rosalía, María Konopnicka (b. 1842, d. 1910). Konopnicka wrote in Polish defying Prussia's colonization of her country and the gradual imposition of the German language, she composed late in life an epic poem decrying Polish emigration to the Americas, depicting in verse the misfortunes, suffering, endurance, disillusionment and nostalgia of a fictional bevy of Podlaks who emigrate to Brazil full of hope and enthusiasm but who return home bitterly disappointed in the end, and like Eduardo Pondal, she penned a rousing patriotic poem which set to music became the unofficial anthem of Poland for decades: "The Oath." The kingdom vanished with the empire at the conclusion of the First World War, but the placename "Galicia" stuck whereas "Lodomeria" did not. In 1920 Ternopil (Polish Tarnopol) was made the capital of the short-lived Galician Soviet Socialist Republic. The Second World War brought Ukrainian massacres of Poles in Eastern Galicia, this was followed by Soviet occupation and rule, still the placename endured to this day. 2 Revista galaica, 7, pp. 3-4, 15 Aug 1874. 3 José Barros Guede. "Eduardo Pondal, Bardo mítico de Bergantiños." La Opinión A Coruña 11 Jan 2008. 4 Daniel Salgado. "Pondal recúa." El País 3 Jun 2011. 5 On April 25, 2013, Sermos Galiza published a long-forgotten poem by Rosalía de Castro in 1867 to honour Liberal politician Salustiano de Olózaga (visit my webpage "Translation of the poem '¡Volved!' by Rosalía de Castro"). 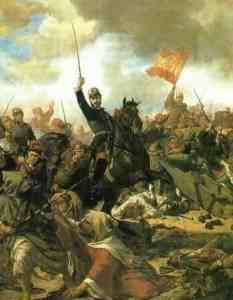 Olózaga was a promoter of the Revolution of 1868 which ushered in the chaotic, self-defeating Six-Year Revolution (1868-1874). 6 Revista gallega, 215, p. 2, 23 Apr 1899. 7 The Portuguese term for such a group is tuna. The contemporary Tuna Universitaria do Porto plays "Ondas do Douro" here. 8 Revista gallega, 360, pp. 2-3, 9 Feb 1902. 9 Readers with a musical bent may enjoy listening to the following songs played aboard the flagship of the U.S. Asian fleet during the conflict: Columbia the Gem of the Ocean, El Capitan March, Home Sweet Home, La Paloma, Liberty Bell March, Nancy Lee, Swanee River, Sweet Amorita, Under the Double Eagle March and Yankee Doodle (full list here). After the war two notorious American marches were composed, Hands Across the Sea to commemorate the victory in Cuba and Admiral Dewey March to celebrate the naval rout in the Bay of Manila. The Spanish wartime repertoire included the following songs and marches, Alma Sublime, Cadiz March, Coro de Repatriados, El Tambor de Granaderos, Felices Días, Guerra al Yankee, La Piñata, Los Voluntarios March, Margarita and Mis Amores (full list in Antonio Mena Calvo, "La guerra hispano-norteamericana de 1898 y su música," Militaria, 13, pp. 133-142, year 1999). Curiously a Cuban insurgency song became popular in Spain during the 1950's, María Cristina Me Quiere Gobernar. Very popular too around this time was the theme song "Yo Te Diré" from the 1945 Spanish movie, "Los Ultimos de Filipinas," which narrates the tardy siege of Baler. The Philippine movie version, "Baler," premiered in 2008 with its award-winning theme song, Ngayon Bukas at Kailanman. The leaders of the independence movement in Cuba and in the Philippines were nationalist poets like Eduardo Pondal; the Spanish American War broke out shortly after the two were killed, José Martí in Cuba (1895) and José Rizal in the Philippines (1896). 10 Revista gallega, 135, p. 4, 10 Oct 1897. 11 Revista gallega, 164, p. 2, 1 May 1898. 12 Revista gallega, 193, p. 4, 20 Nov 1898. 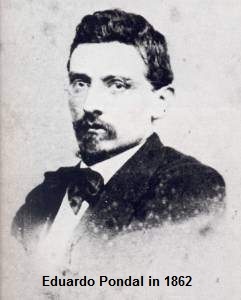 13 Ubaldo Cerqueiro. "Pondal PonteBen." Que pasa na Costa (diario dixital da Costa da Morte) 8 Dec 2010. 14 Revista gallega, 449, p. 5, 25 Oct 1903. 15 Entierro de D. Eduardo Pondal. Real Academia Galega, Boletín nº 116, Tomo 10, pp. 224-229. Year 1917. 16 El entierro de Eduardo Pondal. Crónicas Nerias. To the Real Academia Galega whose online journals archive is the source for most of the poems shown in the Introduction. To Galician Wikipedia whose list of places, parishes, municipalities and counties enabled me to discover the namesake of many proper nouns found in Pondal's poems (e.g. "Maroñas" of poem 2). On October 22, 1859, after protracted harassment of the Spanish garrisons at Ceuta and Melilla, President Leopoldo O'Donnell declared war on Mohammed the Fourth, Sultan of Morocco. The Spanish people reacted enthusiastically in favour of the war and many thousands volunteered to fight. The Spanish offensive captured Tetouan and Tangier and forced the formal surrender of the Moroccan side on April 26, 1860. Anllons (1.1, 5.3, 11.5, 13.10). River that crosses Ponteceso. Parish in the municipality of Ponteceso to whose church bells this poem alludes. Baneira (3.5). In the parish of Silvarredonda, municipality of Cabana de Bergantiños, county Bergantiños. Bergantiños (4.2). County where Pondal was born. Oran (8.5, 12.3). Major port city of Algeria. Ponte-Ceso (8.3, 13.6). Town where Pondal was born. Modern spelling: Ponteceso. Tella (13.7). Parish in the municipality of Ponteceso. "E tí, campana d' Anllons" contains several reverse sentences (4.1-4, 5.2-3, 8.2-3, 10.3-4, 11.3-4, 12.1-3, 12.4-5). A reverse sentence barters logical order for rhyme or a baroque style. For example the lines, "How often did the captive man from Bergantiños on the African sea hear your sovereign pealing in unyielding dreaming" (4.1-4) are a rewording of the original, "How many (times) on the African sea, captive man from Bergantiños, heard he in unyielding dreaming your sovereign pealing." The original is replete with ambiguity, it would seem that the captive man from Bergantiños does the sovereign pealing and someone else on the African sea hears him. Confusing reverse sentences were restructured upon translation. That sundered (6.4). The literal translation, With which you sundered, is redundant; rhyme (6.3, 6.4) is the sole reason for Pondal's use of this awkward reflexive phrase. Cousas (7.2). Things, details. Synonym: matters (5.5). Doente (7.5). Pained. Synonym: aching (5.3). St. John's bonfire (8.2). A bonfire lit on the night of St. John's Eve for celebration. Aló nas tardes do vran! Por cousas d' un mal ausente. O seu amor me aluméa. Dílle o meu penar cruel. Levaba ó compás ca man. Listened to you from Baneira! Of summer afternoons back when! 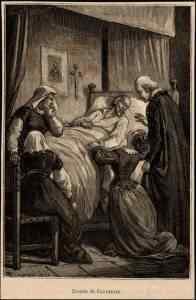 Over matters of a missing ailment. The cords of the heart. As you rang out dolefully. In the prison cells of Oran. Her love affords me light. Relate my cruel suffering to it. At the belfry of Anllons." On the links of the chain. Basontas (9.3). Probably the Sisargas, a group of small islands offshore Malpica de Bergantiños, county Bergantiños. Folgar (1.2). In the parish of Rodís, municipality of Cerceda, county Ordes. Margaride (5.3, 6.1, 6.9, 8.1, 10.1, 13.1). In the parish of San Mamede de Ferreiros, county Arzúa. Maroñas (1.11, 2.1, 7.1, 9.1, 12.2, 14.1, 14.5). In the municipality of Mazaricos, county Xallas. Mount Meda (1.10). Near Padrón. Ures (9.8). In the parish of Canduas, municipality of Cabana de Bergantiños, county Bergantiños. Xallas (1.3, 12.6, 14.2). A county bordering on the county of Bergantiños. "Despois do duro combate" is full of punctuation marks, creating a ponderous style which is fairly common in Spanish literature but rare in English. This translation removes a lot of the punctuation and reorders many sentences or phrases that sound awkward in English (1.3-4, 2.3-4, 2.5-6, 3.1-4, 4.1-4, 6.3-4, 9.7-8, 9.11-12, 11.7-8, 13.1-2, 14.2, 14.5-6). Esquivo chan (2.10). Uneven ground. Synonym: rough terrain (12.6). Vento soán (1.14). Sounding wind. Synonyms: loud wind (7.2), noisy wind (11.4). Xogoral (1.6). Gay. Synonym: gladsome (6.8). Many poems of Eduardo Pondal promote the idea that Galicia is a Celtic nation at heart. The Celts were for Pondal the mysterious ancestors who had erected the dolmens and the ancient-hill-forts (stanza 13 here, #4.2 and #8.5). 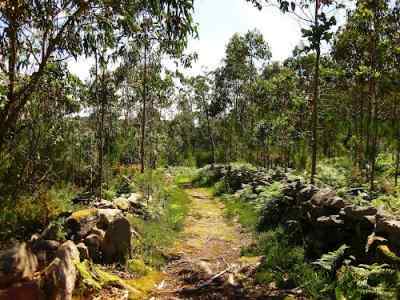 The preservation of these modest Iron Age monuments and settlements signified the preservation of a Celtic identity in the countryside and it insinuated that Romans and Celts coexisted on Galician soil since the first century AD à l'Astérix le Gaulois more or less. Certainly the massive Roman wall of Lugo evinces a hazardous occupation of that territory. At the start of the 5th century AD the Roman Empire disintegrated and the warlike Suevi or Suebi from Germany occupied Galicia. They too had a checkered relationship with the local population. Nevertheless the 170-year reign of the Suevi set the foundation for the medieval kingdom of Galicia. In the year 2011 Explora Films, Spanish Television and Canal De Historia in collaboration with the "Cidade da Cultura de Galicia" Foundation and the Xunta de Galicia produced "The Celtic Legacy," a documentary on the life and customs of Celtic Galicia before the Roman conquest. 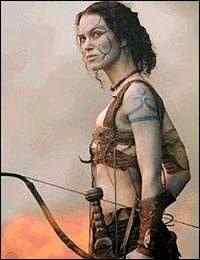 Actors and actresses played out current archaeological knowledge. The documentary was featured at the 9th International Meeting of Archaeological Film of the Mediterranean Area and Beyond held May 7-13 of the following year in Athens, Greece. The film in the Spanish language is shown first below. Da gandra no esquivo chan. Das uces no escuro val. Ou lodo a veña a manchar!.. De Xallas no esquivo chan. Severed by the sounding wind. On the uneven ground of the moor. In the gloomy glen of tree heaths. Sounds very sweet to my ears..."
Of my harp if it pleases you." Sea of Niñons (1.15, 2.16, 3.18). The waters off the beach of Niñons in the parish of Niñons, municipality of Ponteceso. Some verses of "Que barba non cuidada!" are reverse sentences (3.1-4, 3.5-8). Such sentences sacrifice logical order to obtain rhyme or a deliberately prolix style. For example the sentence, "The turbid regiment of a thousand profound yearnings took away (as it did from Lucifer) the original splendor" (3.5-8) reads in the original, "Of a thousand profound yearnings, the turbid regiment, took away (as it did from Lucifer), the original splendor." Reverse sentences show up in much of Pondal's poetry and they often translate poorly into English without rewording. Parece botado do mar de Niñons. Who has taken leave of his senses. Full of dread and affliction! He looks as if he were thrown up by the sea of Niñons. He looks as if he were thrown up by the sea of Niñons.'" To obviate this kind of garbled text most reverse sentences found in the eleven poems were recomposed in translation. Bergantiños (1.2). County where Pondal was born. Breogán (2.12). Apocryphal leader of a band of Galician Celts who eventually moved to Ireland. Ponte-Ceso (1.8). Town where Pondal was born. Modern spelling: Ponteceso. Que s' aprest' a luitar. Ark of Ogas (2.5) is a dolmen better known as the Casota de Freáns located in the parish of Berdoias, municipality of Vimianzo, county Terra de Soneira. Morpeguite (1.1) is the name of a hamlet in the parish of Coucieiro, municipality of Muxía, county Fisterra. The key to the poem is the name "Mouco" (2.1-2, 2.8). "Mouco" has four possible meanings: (i) deaf, (ii) dehorned, (iii) simple-minded, or (iv) greyish, dark, depressing, esp. tempo mouco. The fourth definition is the pertinent one because "Engañosa Morpeguite" anthropomorphizes a common weather event in the coast of Muxia during the winter: the passage of a squall line displacing persistent fog. Te m' has d' escorrer das mans. De mel un doce panal. My hands like an eel again. Mouco, do me no harm. Since our ancient days of yore. 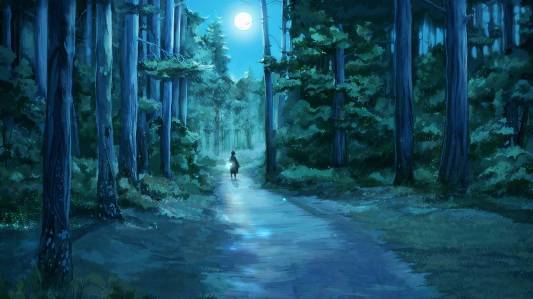 Mouco, let me wander away." Ousinde (7.4) could be a deformation of San Lourenzo de Ouzande parish on the demarcation line between the provinces of Pontevedra and A Coruña or it could tag the surname. The surname Ousinde is extremely rare and confined to a narrow strip of coastland between Ponteceso (where it probably originated) and the city of A Coruña. The cultivation of cherry trees in Pondal's time is reflected in the name of two parishes in the municipality of Ponteceso, Cerezo de Arriba and Cerezo de Abaixo. Some verses of "Á sombra tecida" are reverse sentences (1.7-9, 1.15-16, 1.27-28, 2.9-12, 5.1-2, 5.7-10, 6.3-10). Such sentences are deliberately disordered to obtain rhyme or to don a florid style in Spanish. For example the sentence, "I don't know in what direction impish John started to peer with the eyes of a lizard" (2.9-12) was originally, "With the eyes of a lizard impish John, I don't know in what direction he started to peer." Most reverse sentences translate poorly into English unchanged. A synonym was used to translate the second occurrence of the word, "ligeira,"
Ligeira (1.35). Nimble. Synonym: agile (2.2). "How many cherries there are! Laid himself down on the ground. With the eyes of a lizard. "All right, I won't look,"
By the sainted saint John..."
She came down off the cherry tree. As usual some verses of "Ibas gozando no meu tormento" are reverse sentences (1.4, 2.2-3, 3.4). Such sentences are deliberately disordered usually to obtain rhyme. For example the line, "Levóuch' a faldra curioso o vento" (1.4) which would translate literally as "Lifted your skirt, curious, the wind," garners a rhyme with 1.1, "Ibas gozando no meu tormento." Ay o q' eu vin! My, what did I see! My, what did I see!" The dolmen of Dombate is a megalithic burial chamber beside the hamlet of Dombate in the parish of Borneiro, municipality of Cabana de Bergantiños, county Bergantiños. 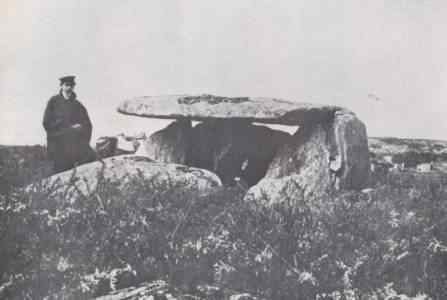 This video has an interesting sequence of photographs of other dolmens in county Bergantiños (min. 5:08 to 6:48). Borneiro (3.3). Parish in the municipality of Cabana de Bergantiños, county Bergantiños. Dombate (2.4, 3.4, 6.3, 7.5). In the parish of Borneiro, municipality of Cabana de Bergantiños. Fonte-Fría (3.1). In the parish of Borneiro, municipality of Cabana de Bergantiños. Modern spelling: A Fontefría. Laxe (3.1). Coastal town and municipality in county Bergantiños. Nebrija (1.4). Author of the first book of Spanish grammar. Nemiña (1.3, 6.1). Parish in the municipality of Muxía, county Fisterra. San Simón de Nande (3.2). Parish in the municipality of Laxe. Uces (2.2). The photograph corroborates Pondal's description, "with its mountain ravine." Vilaseco (2.1, 2.3). In the parish of Borneiro, municipality of Cabana de Bergantiños. Villafañe (1.4). A Spanish conquistador. Viqueira (5.2). In the parish of Nande, municipality of Laxe. Modern spelling: A Biqueira. e ía a cabalo, ledo, cal soen os rapaces. xa vía desde lonxe o dolmen de Dombate. cuase pasaba a rentes do dolmen de Dombate. e con linguaxe muda das súas glorias fale. ¡Canto, ai, mudar pode longa e vetusta idade! nos nosos vellos dolmens e castros verdexantes. sempre ledo exclamaba: ¡O dolmen de Dombate! aínda recordo aínda, o dolmen de Dombate. And I rode horseback happy as boys habitually are. I'd spy afar for the first time the dolmen of Dombate. I'd almost graze it as I passed the dolmen of Dombate. And speaks about its glories with unspoken language. Ah, how many mutations may a long, long time fetch! Our aged dolmens and verdant ancient-hill-forts. I shouted always with joy, "The dolmen of Dombate!" I remember still...still...the dolmen of Dombate. Breogán (2.8, 4.8, 5.8, 6.8, 7.8, 8.8, 9.8, 10.8). Apocryphal leader of a band of Galician Celts who eventually moved to Ireland. Lusitania (6.2). Another name for Portugal. Froxán (7.4). In the parish of Corme, municipality of Ponteceso. There is another Froxán in the parish of Xornes, municipality of Ponteceso. "Os Pinos" has a few reverse sentences (4.1-2, 5.3-4, 6.1-2, 8.6, 9.3). Such sentences transpose the logical order usually to obtain a rhyme. Most reverse sentences translate poorly into English unaltered. Intrépido (9.7). Intrepid. Synonym: fearless (5.4). Vaguedades (4.3). Vague fancies. Synonym: vague notions (6.5). A synonym was used to translate the noun sonido (9.7) which means "sound." Pondal wrote sonido to obtain rhyme with the past participle parecido which ends the previous verse. The synonym used in the English translation, "clamour," rhymes with "rumour" (9.5) and it provides a better, even the intended description. Os brazos tende amigos (6.2). The literal translation is "Open the arms in friendship"; but the article implies the more precise possessive adjective, "your," which was used in the translation. Thanks to the enthusiastic dedication of José Fontenla Leal lithographer and member of the Centro Gallego de La Habana this poem of Eduardo Pondal was set to music by composer Pascual Veiga. The composition was nominated official anthem of Galicia and premiered at the centre on December 20, 1907. The lyrics of the official anthem of Galicia span the first four stanzas of the poem. Do not understand us, no. Of the daughters of Breogán. Of the harps of Breogán. Of the weapons of Breogán. Of the home fields of Breogán." Leonidas (2.2). King of Sparta in 480 BC. Thermopylae (2.4). Narrow mountain pass where the 300 Spartans faced the Persians. Que verte gota á gota! In some other savage Thermopylae! Which trills drop by drop! This one was something great!" The poet named most Celtic heroes of "Salvage val de Brantóa" after places found in the county of Bergantiños. Brantóa (1.1, 3.1). The same as Brantuas parish in the municipality of Ponteceso. Brigándsia (5.5, 8.11). The same as Bergantiños. Carballido (3.4). In the parish of A Graña, municipality of Ponteceso. Cou-d'-lndo (3.2, 8.15). Possible alteration of Cospindo, municipality of Ponteceso. Gundar (1.5, 4.1). In the parish of Nande, municipality of Laxe, county Bergantiños. Lugar (8.16). "The bard Lugar son of Brandomil the leader of the Brandoñas clan in Xallas county was born in the territory of the Presamarcos Celts and in his latter years wandered about the territory of the Artabrians and the Brigantes who inhabited our coasts from Suevos Head to Cape Finisterre" (Note 1 to "LUGAR," poem by Eduardo Pondal published on February 10, 1879, in La Ilustración de Galicia y Asturias, 4, p. 45). Ourens (8.14). Possibly derived from Ourada in the parish of Cores, municipality of Ponteceso. Rentar (3.3, 8.13). Maybe a modification of Rens in the parish of Nande, municipality of Laxe. "Salvage val de Brantóa" is replete with punctuation, forging a ponderous style which is fairly common in Spanish literature but rare in English. This translation discards the excessive punctuation, in some instances by rearranging sentences (1.7-9, 2.11-12, 3.4-5, 6.7-8, 8.5-6, 8.11-16). The original "Salvage val de Brantóa" is a colloquy between Gundar the bard (1-3) and the "wild valley of Brantóa" (4-8). Said colloquy poses three difficulties: (1) Stanza 1 and 3 are third-person self-referencing by Gundar, however stanza 2 is written in first person, (2) Line 5.1, "A bard who sings so well," contradicts the incertitude confessed on lines 4.10-13 about having heard the bard at all, and (3) Line 7.6, "You alone, lonesome hinterland," is second-person self-referencing, an absurdity. Here the translated version assumes three speakers, Gundar the bard, the "wild valley of Brantóa" and the "oaks of Carballido" (2.4). Play annotation identifies each speaker. This presentation removes the aforementioned difficulties and the poem gains extraordinary clarity. Tan só de ti conocido. E por non séi qué suspiros. Asilo és dos bardos digno! And sighs for I know not what. And of the rumorous pines. To the friendly tilth of home. Are a worthy shelter for bards!